So we packed up the Clorox wipes, hand sanitizer, high chair cover, stroller, monitor, oxygen, feeding pump, formula, baby food, clothes, and other accessories (WHEW! Is it me or is anyone else tired just talking about it?!) and we headed towards the Windy City! We really could have stopped after Ikea because that place will wear you out! Josie even had to rest her eyes﻿! But we kept going because we are shopping warriors! We made it through Oak Brook Center where Josie perked up again and enjoyed every sight and sound. After being on quarantine all winter, it was so much fun to watch Josie become captivated by each new experience. She was an absolute doll the whole time! Later that night, we enjoyed a delicious dinner a Maggiano's. This turned out to be the highlight of my trip because we were seated next to Gina, a beautiful young lady with Down Syndrome, and her family. It was rather serendipitous, because we changed our minds at the last minute and cancelled our dinner reservation at another restaurant. It's always a pleasure meeting other families who have been blessed by Down Syndrome and Gina and her family were fantastic. And even though it doesn't look like it (hey - we'd had a LONG day! 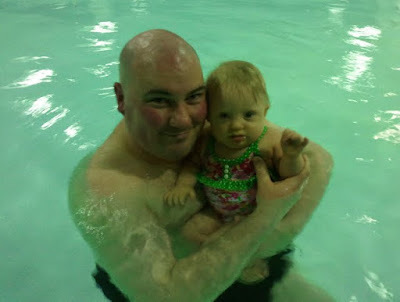 ), Josie enjoyed her introductory aquatic experience. We all had a great time on our little excursion and we look forward to many more in the future! Special thanks to my sweet husband for his spontaneity and thoughtfulness. And special thanks to Josie for being the kind of one year old you can taking shopping all day long without an ounce of regret! Yay! I am so happy for you that you got to take your well deserved shopping trip. Glad Josie had a great time and I can't wait to hear about all your purchases! Wahoo, loving that baby in the swimsuit!! WOHOO - "Josie Does Chitown!!" A natural born 'shopper!' And since we can't have Josie, could we please order 2 of those beautiful spring green pillows she's leaning against on the couch? 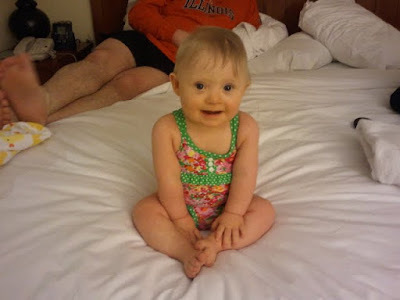 She looks so sweet in her swim suit sitting on that big hotel bed!